May publishes Geddry.com, a southern Oregon coast centric blog focusing upon social, economic and environmental justice. She began blogging when her oldest son went to war in Iraq and identifies as a Marine mom. 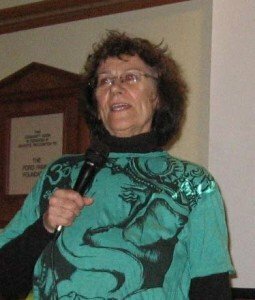 Mary served on the board of ROP and has been active with Military Families Speak Out, Veterans for Peace and multiple peace organizations. 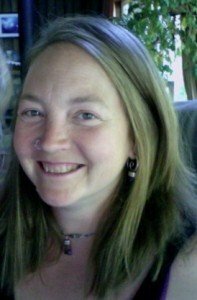 Mary serves on the board of Coos Community Radio – KJAJ-LP FM and Coos Commons Protection Council and is a chief petitioner for the citizen initiative The Coos County Right to a Sustainable Energy Future Ordinance. Hi! I’m co-founder of Community Rights Lane County and helped form Freedom from Aerial Herbicides Alliance. My family has been personally harmed by aerial herbicide sprays in the Triangle Lake area. After working within the existing system for over 5 years, I was introduced to Community Rights and immediately became involved. I’m simply a woman, who is a daughter, sister, wife, mother, and grandmother whose life took an abrupt turn in January of 2011 when I went from retiree to activist, advocate and defender of life. The shift took place when learning Atrazine was going to be sprayed by helicopter on 70 private acres of timber land owned by our local mill, less than two miles from my home. What began was a journey of research and discovery. What was Atrazine? More importantly, how was it possible helicopters were allowed to spray toxic chemicals into residential neighborhoods in Oregon? Friends and neighbors formed a group and named ourselves Precious Dirt, our original goal being to bring public awareness to these practices. After years of working ‘within the system’, what we now call the ‘Box’, we realized we the people have zero rights when it comes to these toxic applications. In Oregon the powers to be crafted a law called The Right to Farm and Forest Act, which is nothing more than yet another preemptive law taking away local rights of citizens. In this case to resist toxic applications, while giving the power to the corporations and our state to freely use these practices. Thank goodness after three years of seeking help we discovered CELDF (Community Environmental Legal Defense Fund) and created the Freedom from Pesticides Alliance. Our hope was to craft an initiative to give citizens the right to say no to these toxic practices. We lost our first attempt, but have by no means given up the fight to protect our right to say no to the toxic trespass this state has wrought against its citizens for far too long. The health of our air, water, and soil, and bodies is critical to the health of our communities and future. The miracle of life is in urgent need of protection—hence our work.